BIRMINGHAM, Ala. (AP) — Founded to teach about human rights and the fight for equality during the days of racial segregation, the Birmingham Civil Rights Institute is introducing a new topic: Lesbian awareness in the South. 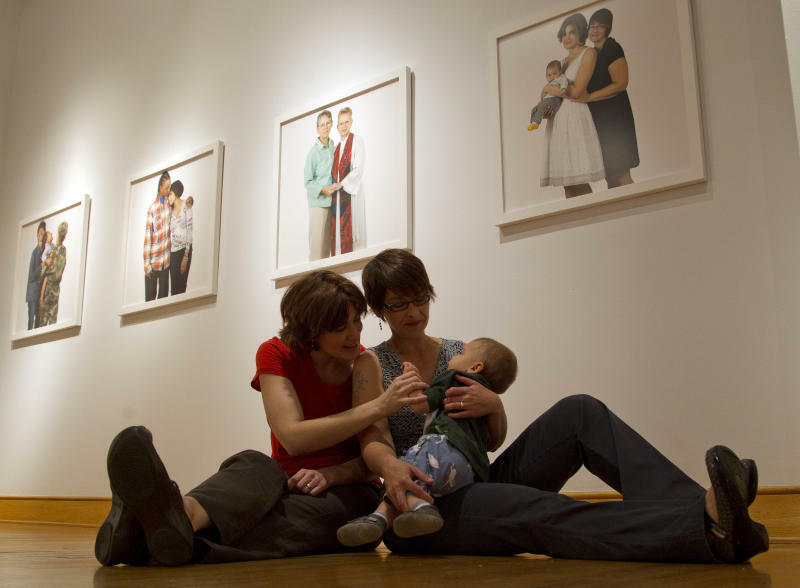 The museum opens a new exhibit Friday night featuring photographs of lesbian couples and families living in the Deep South. Some women are depicted arm-in-arm or embracing with their faces fully visible. Others who weren't comfortable being identified publicly are pictured with their backs to the camera. Some photos include the women's children. The 40 images are stark and plain. Shot against a white background, there's nothing but the women and their kids to draw viewers' eyes. Two women are shown in military uniforms with their faces to the side; two female ministers were photographed in clerical garb. The women are young and old; While one couple is kissing there's nothing sexual about the photos, and everyone is fully clothed. Organizers say the exhibition is meant to encourage civil dialogue about inclusion and equality in Birmingham, once a flashpoint of conflict and violence in the civil rights movement. The museum is down the street from the spot where firefighters used water hoses to douse young civil rights demonstrators in 1963. While lesbians are the focus of the exhibit, titled "Living in Limbo: Lesbian Families in the Deep South," professional photographer Carolyn Sherer said her work also is meant to encourage greater inclusion for gay men, bisexuals and people who are transgendered. "We're hoping to start a conversation about equality for everyone," said Sherer. 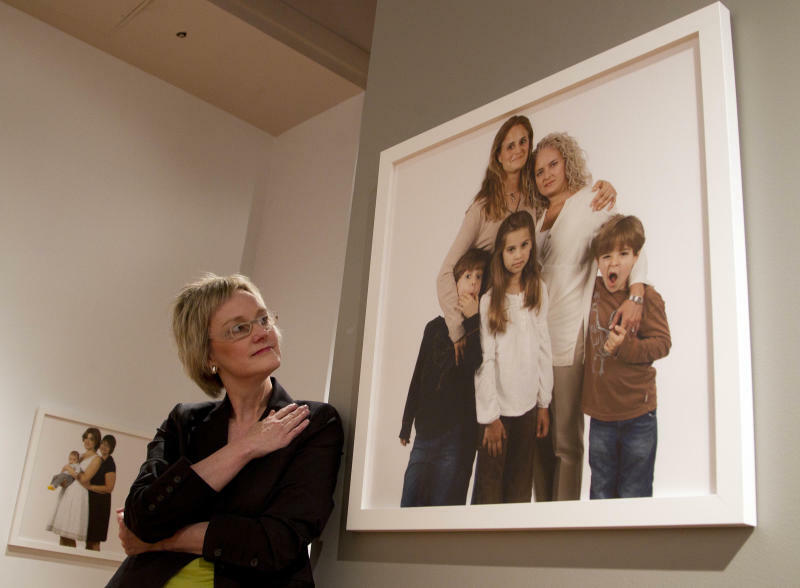 She has never before acknowledged her homosexuality publicly, but the exhibit includes a photo of her and her partner. Alabama is a deeply conservative state, and Sherer expects some "push back" once people begin filtering through the exhibit, located beside galleries that document the struggle for civil rights in the 1950s and '60s. School groups tour the institute almost daily. The art exhibition, which runs through June 11, is the first at the 20-year-old Civil Rights Institute to feature homosexuals. The longtime president of the museum, Lawrence J Pijeaux Jr., said Thursday he has received more than 125 emails in support of the exhibit and just one complaint. "I've been pleasantly surprised with the reaction," said Pijeaux. As he spoke, a museum director hung the final portraits ahead of the opening. Sherer, who grew up in Birmingham, said she was inspired to do something to encourage greater understanding and acceptance of lesbians after a friend died. The woman's female partner met resistance from the family when she tried to get clothes and other items from the home the couple had shared, Sherer said. "That galvanized my resolve to go ahead and address my own identity as a lesbian," she said. "This is really my coming out story." Armed with an idea and a camera, Sherer said she approached friends in the lesbian community and asked them to let her take family portraits for display at the museum. "Most of my friends would not do this even with their backs to the camera," she said. But a few did agree, and word of the project spread along with some of Sherer's initial photos: Soon, the dam broke and women agreed to be photographed. Anna Koopman said she and her partner, Hanne Harbison, attended a photo session with their 9-month-old son Amon after getting a couple emails about the project. Koopman said she and Harbison had to overcome some initial doubts about being photographed as a family, but she is glad they did. "It felt really monumental. It felt really courageous on the part of the artist, and it felt really great for us to stand up and be seen as part of this," said Koopman. "Who we are is love and commitment and caring, and we were very excited to be counted in that regard." While the downtown institute is best known for its focus on civil rights, Pijeaux said the exhibit fits its overall theme of promoting human rights. "I think it's important to note that we don't take sides on issues. Our goal is to bring people together to talk about issues so they can leave with some common ground as we all wrestle with many of the problems we have in the community at large," he said. "This exhibition lends itself to that end."